ABOARD KINDAT PANDAW-Early on a cool, rainy morning, the first such weather of our trip, we downed a cold buffet breakfast and bade last minute “good-byes” before our guide arrived to transport us to Mandalay Airport. An hour’s drive from the “jetty” we boarded a plane for Heho, the airport that serves Inle Lake and other destinations in southern Shan State. We mentioned in our first post having arranged for pre-and post-cruise visits, beginning in Yangon before embarkation and ending-up in Inle Lake area following debarkation. Though we made these arrangements through China Travel Service all our accommodations, transportation and guides in Myanmar were handled by Asian Trails, a travel service company covering Southeast Asia and China. Though unknown to us beforehand, we give them high marks for their engaging, knowledgeable guides and lovely accommodations. Upon landing at Heho, our guide Kyi and driver Khaung headed for Pindaya Caves, but took a short detour in the village of Kayut-Htep. Here in a hilltop compound, neither especially old, nor especially beautiful, we sat on the floor sharing tea and a snack with young men and women. This ordinary village monastery serves as both community center and religious retreat. 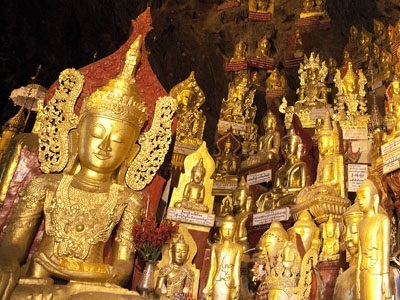 The wonder of Pindaya’s limestone caverns is the 8,000+ Buddha images, mostly golden, placed here over the past 2-1/2 centuries by the devout. It’s an overwhelming sight. We overnighted at Royal Kalaw Hills Resort in Kalaw, a hill station at about 4,300 feet elevation. Our bungalow in this colonial-style, 17-room accommodation was spacious and well-appointed, and our dining room dinner of prawns, vegetables and steamed rice was spicy and delicious. An Inle Lake leg rower powers us to our hotel. Kyi and Khaung arrived next morning to motor us to Nyaungshwe on Inle Lake. We briefly investigated a slightly decrepit colonial mansion and Kalaw’s 1930s railway station, once used by colonial administrators escaping lowland summer heat. En route we wandered through the bustling market town of Aungpan. At Nyaungshwe we and our luggage transferred to a long-tail boat to Inle Princess Resort. Here our accommodation was a spacious wooden bungalow on piers above the water. Our tours that afternoon and the following morning were all via long-tail boat. After lunch we visited a silk and lotus-fiber spinning and weaving workshop, and a boat-building yard where the Inle Lake long-tails and canoes are crafted. On our final day we motored the length of Inle Lake and up a creek to the village of Inthein and the Shwe Inthein stupa complex. As we entered the temple we ran into Michael and Barbara, the Australian couple from our river cruise! 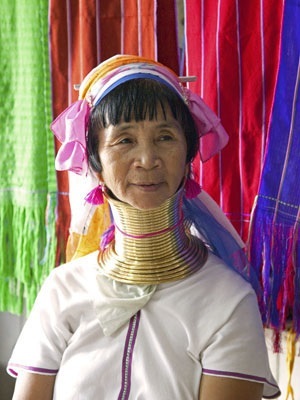 After sharing a whole fish and rice for lunch we visited a workshop employing Kayan Lahwi or Padaung women, famous for brass rings that stretch their necks from girlhood. 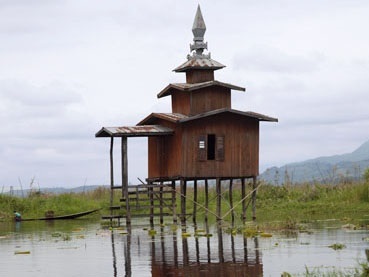 Inle Lake is a world apart, completely unlike anywhere else we have visited. Wooden stilt villages hug the edges of the lake housing the Intha people who wrest a living from the lake by fishing, growing vegetables in floating gardens, and by various handicrafts. They travel everywhere by boat, now mostly powered by diesel and petrol engines, but sometimes still powered by leg-rowing. Our 30-hour journey home, due in good measure to long layovers in Yangon and Hong Kong, gave us plenty of time to reflect on a memorable journey. Thank you very much for sharing this wonderful story about your experiences in Myanmar with us. It was a delight reading through your article and we hope that you will cherish these memories forever. With our sincere thanks and happy (cruise) trails!